There are three typical ways a divorce process can end: Reconciliation, Judgment, or Settlement. 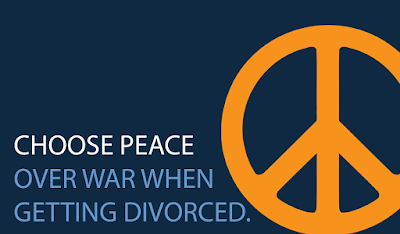 Very few cases reconcile once a divorce process is started, and very few cases go all the way to Judgment. In other words, most divorce cases settle, either before going to court, or at some time during the court process. But settlement takes lots of different forms, and those different forms can have a significant impact on whether people feel good about their settlement or not. 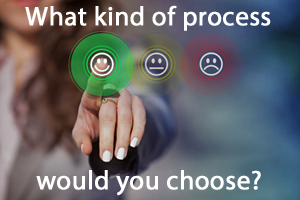 Many clients and potential clients have asked me if there is any statistical research on outcomes for different processes, or even whether there is any data on whether a particular process is considered more "successful" than other options. Unfortunately, I am not aware of any large scale study comparing Mediation, Collaborative Law, Arbitration, Self-Help Negotiation and Litigation, or even anything close to comprehensive. There is some research comparing mediation and litigation, but not much else. In the absence of analytical data, all I can share with clients and potential clients is my own experience working with divorcing clients. I have helped people divorce through litigation, through negotiated settlement, through mediation, and through the collaborative law process. I can state with certainty that in my experience clients who settled via mediation and collaborative law were more satisfied with their outcomes than my litigation clients, and it is the primary reason we have transitioned our primary practice areas to these dispute resolution processes. I recently attended an uncontested divorce hearing with my client to present to the court a settlement agreement reached through the collaborative process, and something amazing happened after the hearing. This was a very complicated case and the client had first entered my office three years before. He knew from the start that he wanted to work outside of court to reach a settlement with his wife, but that doesn't mean it was easy. The case involved very complicated assets, legally and financially complicated issues over inheritance, and many emotional ups-and-downs between the clients. We had over 30 different revision versions of a separation agreement. Despite all of that, we did reach a final settlement, and all this history made what happened after the hearing all the more surprising. The Collaborative team involved numerous people throughout the process, including a financial adviser, a separation therapist, a collaborative business attorney, and two different divorce attorneys for the wife. While it is typical to use other professionals to help throughout the Collaborative process, for over two years much of the work in this case was done with just the two attorneys and the spouses. We had many settlement meetings and shared numerous lunches together. We were adversaries but working towards a common goal, and all of that led up to the postscript to our hearing. The hearing itself was uneventful and the Judge approved the agreement with a minimal amount of questions about its content. She commended the parties on reaching agreement with such complicated issues involved. Outside the courtroom we shook hands as is typical after reaching a settlement, and then something else happened. My client reached out and hugged his wife's attorney. She smiled, and surprised, she said "I don't think I've ever been hugged by an opposing party in a case before." At the same time, her client did the same, reaching out and hugging me. This wasn't my first time. Though it is unusual, I have had other collaborative cases where the counsel and/or the clients ended the case with a hug. This is the what can happen when you pay attention to how you divorce, and how you resolve conflict, as much or more than what you get or give in the divorce. I can feel good (and so can my clients) about choosing to resolve conflict in a process that recognizes the humanity and dignity of every person involved. I don't expect (or even want) a hug in all of my cases, but I can feel good about participating in a process where that is even a possibility.